Let Printful’s Nora Inveiss walk you through everything you need to know when partnering with a dropshipper to sell your art online. Creating and selling your art is a big deal. You’re proud of what you created and you can share it with the world by opening an online store with Big Cartel. But running an online store isn’t a walk in the park. It’s an overwhelming prospect if you’re just starting, and it can be even harder to keep up if your shop takes off and you’re getting huge orders. The good news: There are tools out there to help make your life easier! Let’s look at dropshipping, which is essentially when a third party prints and ships your products or art for you. We’ll help you figure out whether or not it makes sense for you to use dropshipping to sell your art online and what you should look out for in an ideal dropshipper. The main benefits of dropshipping? The convenience and the low cost. With a dropshipper, you don’t have to spend time printing your designs, packaging, and shipping. This means you get more time to do the fun stuff. If your work is already well-known and you’re selling in large quantities, then you know how hard it can be hard to keep up and manage demand - a dropshipper could help even out the workload. Even if your shop isn’t a full-time gig, dropshipping frees up time in your schedule. The next biggest benefit is the cost (or lack thereof). If a dropshipper is taking care of your printing, then you don’t have to invest in equipment. You also don’t have to buy piles of stock ahead of time and run the risk of a particular item not selling well. Dropshipping is a great way to test out a new design or product with minimal financial risk. That being said, there are downsides to dropshipping. First, if you enjoy the manual process of printing and packaging, you might not want to give that up. You also might not like the fact that you can’t oversee the printing and quality. Giving another business control of your work is a big leap of faith (although a good dropshipper should provide consistent, quality prints). Next is your branding. While most dropshippers are white-label (they don’t show their brand anywhere on your orders, so it looks like they came from you), you’re more limited to how much you can personalize each order. No more handwritten thank you notes. And finally, you can’t really call your work handmade anymore. This might not be a big deal depending on what you sell, but if your brand is based on artisanal, handmade work, this takes away from the charm your customers may expect. Carefully consider your priorities. Do you enjoy the manual printing process, or would you rather outsource it and save yourself some time? Do you have the resources to invest in equipment, or would you rather test your ideas risk-free first? Are handmade, one-of-a-kind items a big selling point for you? What can you sell with a dropshipper? You’ll find dropshippers that print on anything and everything: t-shirts, posters, phone cases, tote bags, sunglasses, bedding. And you might be tempted to run away with all of your ideas. But first, take a minute to really think about what you want to sell and what works for your art and your audience. The first step is to think of what kind of products you want to sell and whether it makes sense to outsource. If you live and die by DIY, it’s easier to go that route with some products than with others. For example, setting up a screen printer for t-shirts is more manageable than a printer for large posters. You also don’t have to outsource everything in your store - just the items that are too difficult to create on your own. 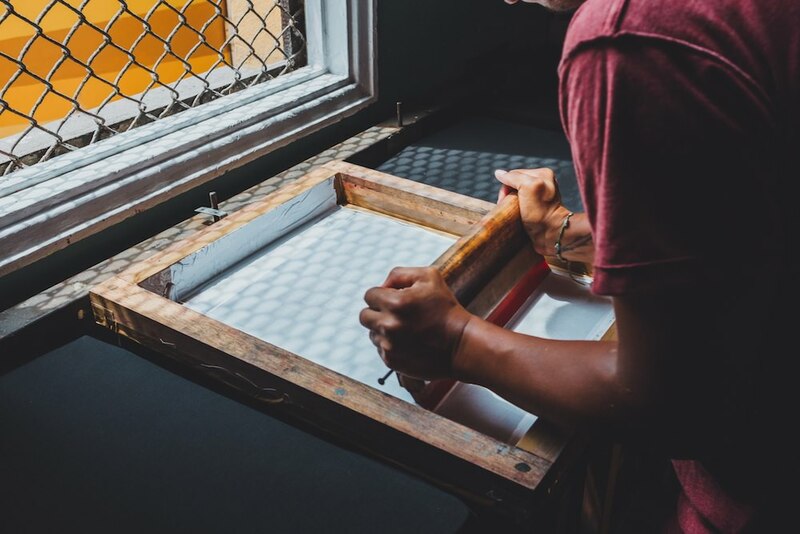 Maybe your specialty is hand-painted canvas, but you’d also like to get your designs on t-shirts. You could keep painting canvas but let a dropshipper handle the t-shirts. If you do want to outsource part of your product line, then think about what would look best with your designs. For example, if you’re a photographer, your prints would look great on posters, phone cases, and mugs, but they would be stretched out and warped on leggings or other stretchy apparel. Some work might just sell better on one type of product than another. Take Startup Vitamins as an example. 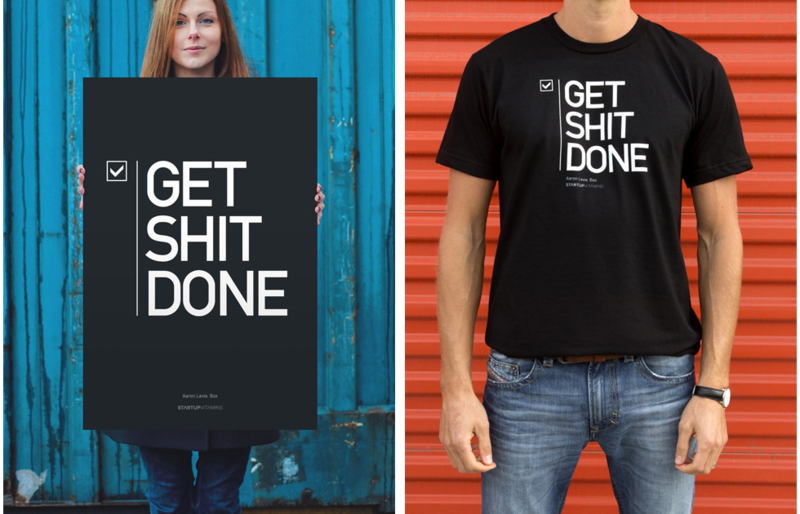 The poster on the left is one of their best-selling products. The t-shirt on the right, with the same design, isn’t as popular. Both designs look good. But the poster packs a little more punch. Most dropshippers let you order samples at a discounted price, so you can test different products with your work and see what looks best. And what about your target customers - what would they want to buy? Would they be happy with your art on canvas, or would they also like your designs on mugs or pillows? This is something you can easily test with dropshipping. So which dropshipper should you work with? And what should you look out for before making a final decision? There are a lot of reputable dropshippers out there, so the choice can be overwhelming. You can start with something that works with your Big Cartel store, like Printful or Art of Where. Product selection. Do they even offer what you’re looking for? And how good are their products? For example, if you want to print on a poster, do they offer the type of paper you need? Graphic designs look great on matte paper, but a photograph would look better on luster paper. Price. How much does it cost? Some dropshippers are cheaper than others, but bear in mind the quality you’re getting. A more expensive t-shirt might mean a better quality print or that it’s made in the USA. Integrations. Do they integrate directly with your store? A direct integration would make your life a lot easier - it means an order goes directly from your customer to your dropshipper with little involvement from you. When you have a basic understanding of what each dropshipper can offer, then reach out to them directly. After all, you’ll be working with them to run your store. You better make sure you actually enjoy communicating with their support team. Do they answer all of your questions clearly? Are they easily reachable through email, chat, or phone? How long does fulfillment take? What kind of shipping speeds and carriers do they offer? How do they handle damaged products or misprints? How long on average does it take to settle customer support issues? Can you customize your packages (with things like stickers or messages)? If you have a product in mind they don’t offer, will they plan on adding it? And more importantly, make sure you can get order samples. It’s the only way you’ll be able to stand by your work and find out which dropshippers print with the best quality results. If you want to sell your art online, dropshipping is a risk-free, convenient way for you to ease the workload or get started. Figure out what your priorities are in running your store and whether it makes sense for you to outsource, and do your research on which dropshipper fits your needs. Once you find the perfect partner, let them do the dirty work so you can focus on your craft. Nora Inveiss is a content marketer at Printful and regularly contributes to their blog. Printful is ideal for artists - they offer some handy features like pack-ins, discounted samples, a large product selection, and more. They’re also the only dropshipper that doesn’t outsource their printing - they control everything from A to Z.